An Agent performing SCP-3688. Face blurred at their request. Special Containment Procedures: Any discovered historical data pertaining to SCP-3688 is to be retrieved by Foundation personnel, and any civilians aware of its existence are to be amnesticised. Any active members of a Mobile Task Force and any Foundation personnel ranked Level 3 or higher should be given the opportunity to learn SCP-3688, though doing so is optional. Description: SCP-3688 is a series of kinetoglyphs1 that, when performed in sequence and with a sufficient degree of accuracy, causes the performer to become functionally invincible for the duration. This invincibility is achieved via the violation of a number of fundamental principles of physics. 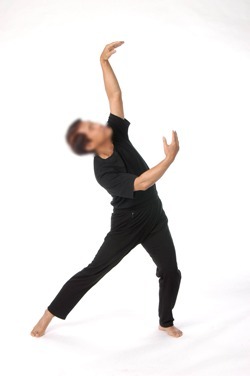 Many of the movements required involve the whole body, and have been described as "rhythmic" and "energetic". The movements required by SCP-3688 for successful activation of its properties are complex (approximately 85% of Foundation personnel attempting to learn SCP-3688 have been unable to execute it successfully), but are structured in such a way that once started they can be repeated indefinitely. Successful activation of SCP-3688 begins once the first nine to ten seconds of the sequence has been accurately completed, and can then be continued for as long as the performer is able. No method of stopping a performer of SCP-3688 against their will has been found, though bodily functions and requirements for sustenance are not affected by the process. The following are excerpts from the full SCP-3688 testing log, performed on individuals confirmed to be actively and successfully performing SCP-3688. Test: Application of blunt force using a wooden baseball bat. Result: No effect. In cases where the bat intercepted a moving part of the performer's body, the bat was deflected without apparent effort. Bat eventually broke following successive impacts. Test: Attempted restraint of performer via wall-mounted steel chains. Result: As soon as the chains were affixed to the performer, they were forcibly torn from their wall mounts by the motions required by SCP-3688. Continued motion caused the chains to entangle the performer, at which point they snapped. Test: Collision of a remotely-piloted utility vehicle travelling at 70km/h with performer. Result: The vehicle was split in two at the collision point as its momentum carried it into and beyond the performer, who was unaffected by the impact. Remaining wreckage was displaced as it intersected the movements of the performer. In concert with the Department of Thaumatology, the Artistic Anomalies Department and the Department of Kinetography, we have, functionally speaking, been able to reverse-engineer SCP-3688. We still don't know why it works, but we do know how to develop additional kinetoglyphic sets that we believe, when properly deployed in the field, will be of great use to the Foundation. Project Marqod is an ongoing multi-departmental effort to develop new kinetoglyphic sets and to train Foundation agents in their use. To that end, Mobile Task Force Sigma-2 ("No Friends Of Mine") has been formed from agents possessing the necessary levels of coordination and agility to perform the manoeuvres in the kinds of scenarios that field teams frequently find themselves. Due to the high success rate of Sigma-2, authorisation has been given to increase the scope of the project. Additional resources have been granted for the further development of new kinetoglyphs and additional recruitment is ongoing, though finding willing participants with the necessary physical performance experience has proven difficult. Following is a list of kinetoglyphic sets in which MTF Sigma-2 agents are currently trained. SCP-3688 Personal invincibility for the duration of the performance. The originally discovered set from which the others are derived. Colloquially referred to by Sigma-2 agents as the "Safety Dance". PMK-01 Generates a spherical field of a radius equal to the combined height of the performers, through which no energy or matter can pass. Requires two performers simultaneously enacting the necessary movements to function. PMK-02 Creates a mobile temporal distortion field centralised on the performer, causing them to experience time more slowly. Magnitude of the effect is related to how long (in base time) the kinetoglyph is performed for, and lasts for approximately 60 seconds once the performance is complete. Outside observers see the performer moving at increasingly high speeds. PMK-03 Enhances the senses of the performer for approximately one minute following the conclusion of the set. Possesses a vocal component which must be performed in sequence with the movements for the kinetoglyph to function. The vocal component is painful to those already under the effect of PMK-03. PMK-04 Manifests physical duplicates of the performer. No known upper limit on the number of manifested duplicates, but each duplicate is integrated into the movements required to continue the kinetoglyph, exponentially increasing its complexity. Duplicates are controlled directly by the original performer, and exist for approximately one hour. Currently observed maximum number of duplicates manifested is seven. PMK-05 Annihilates all solid matter within the target area. The most complex of the developed sets, requiring five performers moving in perfect synchronicity. The target is defined as the pentagonal area formed by the positions of the performers, covering a height of approximately 20m. Only successfully used twice, once during testing and once during incident 3688-1 (the "West Side Incident"). 1. Kinetoglyphs, or kinetohazards, are physical and mental anomalous effects that occur when an entity performs specific motions and gestures.